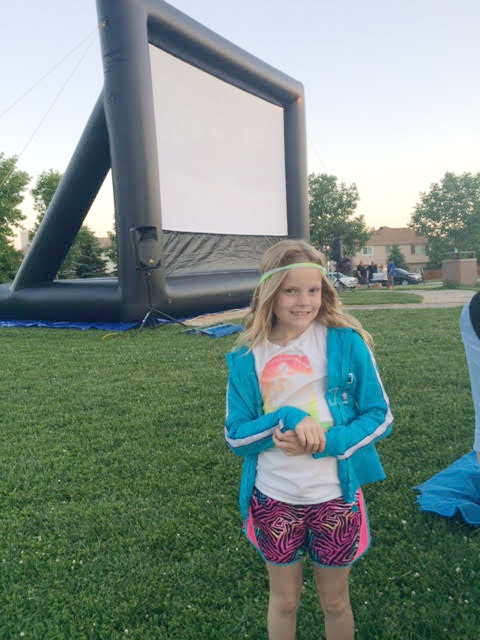 About 50 people attended our first ever ECC “Movie Night Under the Stars” event held Saturday May 30th in the park. Children appeared to enjoy eating popcorn, playing with the glow sticks and watching the PG rated flick “Earth to Echo.” Adults sat in lawn chairs or stood. Some drank vino and many socialized with neighbors. Due to the popcorn machine using up a lot of juice combined with the movie screen electricity donated from a kind & generous neighbor’s home, there was a little snag that was quickly fixed. Oh the fun that was had! A third party company ECC hired set up the gigantic movie screen. It was a great alternative to watching a movie from a home TV set -especially under the stars in our park. It got a little chilly as the sun went down organizers report. But everyone appeared to have a great time! Elk Creek Crossing HOA would like your feedback. What did you think of the event? Next Omaha’s National Night Out Comes to ECC | Tues. Aug 4!